The MSP presence in South Korea started through an invitation in 1990 by Fr Jerry Hammond MM, then Provincial Superior of the Maryknoll Fathers in Seoul. 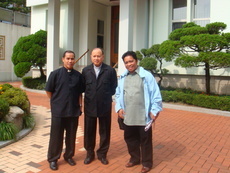 Fr Socrates Mesiona MSP went to Seoul and discussed the agreement with the Maryknoll Missionaries. When the agreement was finalized, the MSP sent three seminarians (now priests), namely, Leonilo Pacuribot, Gorgonio Llubit Jr and Rolando Detera for their Overseas Training Program (OTP) exposure. The MSP apostolate in the Land of the Morning Calm is focused mainly on the Filipino Migrants, especially the Hyehwadong Filipino Catholic Community. However, it reaches out too its service to Filipino migrants of different faiths. With the support of the Archdiocese of Seoul, the MSP was able to establish the Pastoral Center for Filipino Migrants, where Filipinos in distress have been temporarily sheltered, counseled and given opportunity to participate in the celebration of the Holy Eucharist. In 1998, Fr Jaron was left alone to carry out the work for the Filipino migrants. Later, he was joined by Fr Salvador Marcaida MSP. In 2005, Fr Marcaida was transferred to the new mission in the Diocese of Uijeongbu. The apostolate in Uijeongbu also focuses on the Filipino migrants. In 2007, Fr Alvin Parantar MSP was sent to Seoul in order to continue Fr Jaron’s post at the Center and the MSP apostolate for the Filipino migrants. In 2008, when Fr Marcaida left, Fr Isidro Alimbuyong took over as the new chaplain of Filipino migrants in the Diocese of Uijeongbu.